Our allergy menu allows food businesses small and large to maintain a mobile accessible and up to date menu that customers can tailor to their food preferences, making it easier for them to see which dishes are suitable for them and to comply with the law. Your customers can access this menu online, via a mobile phone and App, allowing them to select their individual food preferences so that the dishes they choose are appropriate for their allergy or intolerance. Staff can use the allergy menu too, making it easier for them to make sure they are giving the right advice to their customers. It's also a fun way that customers can check out your menu from their home or outside your building, allowing them to make choices before they arrive and share their friends too. Sign up and not only will you meet the government regulations for allergies in one simple step, you can meet your customer's needs too. Customers & Staff can download the App and quickly find the dishes they can eat. Improve your customer experience for allergy sufferes, vegans and veggies. "This really helps improve how restaurants provide their allergen information, in a way that's easy to manage and update, I wish all restaurants used it." "Vegan food is the most inclusive type of food because it is often suitable for those with allergies and intolerances, provided it's free from allergens. 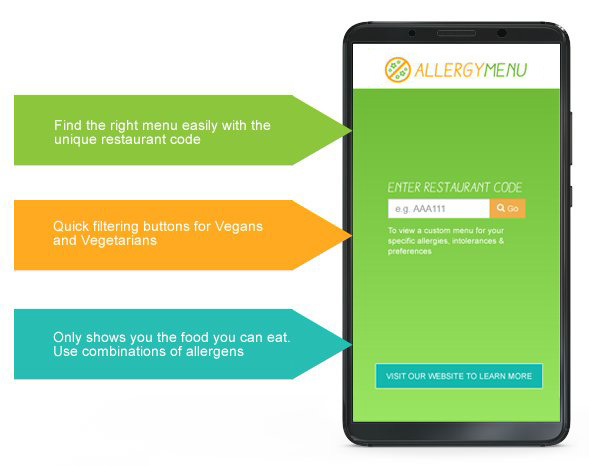 We are fully behind Allergy Menu's battle to improve food safety in restaurants and welcome the filter for food preferences that includes veganism, which makes it easier to search for vegan food. " "Our food safety consultant is dealing with this for us along with our head chef. They have been very impressed so far :)"